Alfred Hitchcock Presents (TV) (1987) - Lt. He has also worked as a voice actor producer film director and screenwriter in movie and television series in various Canadian and American productions. He is best known for playing villains and "tough guy" heroes though he has also portrayed sympathetic characters. 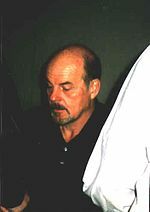 Michael Ironside (born Frederick Reginald Ironside; February 12 1950) is a Canadian actor.